My site has been on the fritz for a week. Apparently, my account was being “upgraded” to a new hosting server. Some kind of upgrade. I liked my old server just find when my site was up and running. Sigh… I guess it was a good thing it happened this past week. I’ve been swamped. And I’d completely neglected my blog. Look on the bright side right? I’ve had a crazy week. And on little to no sleep, I haven’t been in the mood to do much cooking. But I did manage to make some Sautéed Green Beans with Spicy Korean Chili Pepper Sauce (alternatively, Sautéed Green Beans with Gochujang Sauce). I started making this dish, because it was very reminiscent of the dried-fried string beans I enjoyed so much in Chinese restaurants. And I used to make this often – two to three times a week! But for some reason, it hasn’t made an appearance on our dinner table for quite some time. So it was about time I made it again. These green beans add a kick of flavor to any meal. And although I can make a meal out of these beans (along with some brown rice), I usually serve them with some pan-fried tofu for the sake of protein. Wash and trim the green/string beans. Drain and dry. Stir together minced garlic, chopped green onions (white part), gochujang, tamari, agave, toasted sesame oil, and toasted sesame seeds. Set aside. Heat a wok or pan over medium-high heat. Add oil and swirl to coat the pan. Once the oil has been heated, add the string beans and sauté until the beans brown lightly. The surface of the beans will appear whitish with gold brown hue. This should take about 5 minutes. Remove from heat. Remove the beans from the pan. Heat the pan again on medium heat. Add the sauce from step 2 to the pan. Stir the sauce like you would scrambled eggs – “folding in” the edges with the rubber spatula. Once the sauce starts bubbling and becomes fragrant (it will smell nutty and peppery, yum! ), add the reserved beans. Lower the heat and mix well. Remove from heat and stir in the chopped green onion (green part). Mix gently. If necessary, salt to taste. If desired, garnish with additional chopped green onions and whole toasted sesame seeds. Note: Make sure that you use toasted sesame seeds and oil. Taste will markedly differ. If you’d like, you can toast your own sesame seeds. It’s fresher and more flavorful. Thank you! It’s yummy and easy to make! 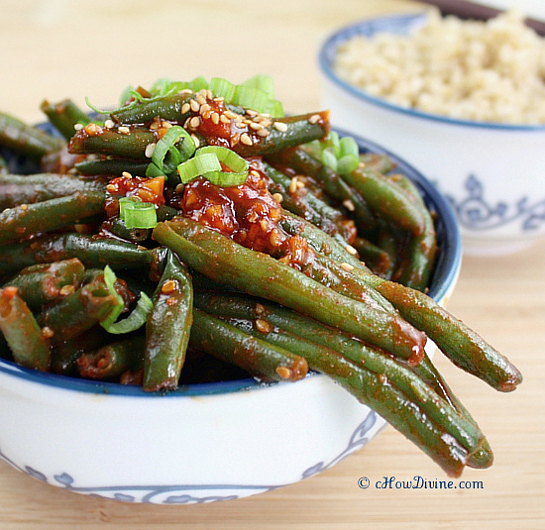 wow this spicy green bean dish really speaks to me! Green beans, in my opinion, is one of those vegetables that needs to be dressed up with strong flavors. The gochujang sauce definitely does the justice. Thanks for this wonderful recipe! Agreed! Whether it’s soy sauce, chili sauce, or just plain old sea salt, I like my string beans dried-fried quickly in a little bit of oil (keeping it healthy, of course) and slightly salty/spicy! I was missing your blog since I love Korean food! Wonderful recipes and I am really happy that I bumped on your blog today. 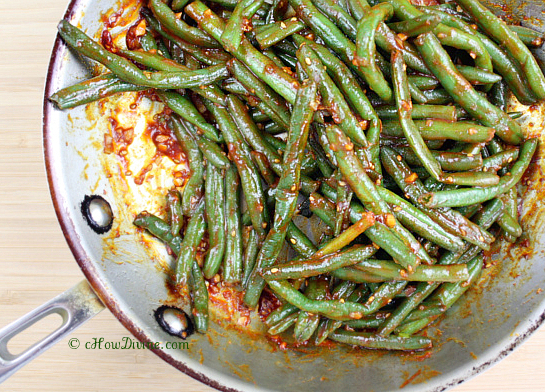 I am going to try this sauteed green beans recipe very soon. Thanks for coming by the site! I hope you like the recipe! Thanks! They are really yummy w/ some brown rice! Oh wow…those green beans look amazing! I could eat them alone! I am loving this recipe and those pics are very tempting! Thanks Sandra! I do eat them alone sometimes. I love spicy and sweet! Yay! My parnter and I tried out four of the namul last night–the wonderful cucumbers, the sauteed carrots, the sauteed zucchini and these beans. All are brilliant, but these beans really pop! I think I found a new addiction. You were right, when the sauce gets sauteed, the aroma was completely intoxicating! The Korean market we got our supplies at had ready-to-go bulgogi, so we got our grill out and had a fabulous meal. So nice to have such easy to follow, delicious recipes! Can’t wait to explore more of them. Seriously, a huge chunk of our food budget went to our favorite Korean restaurant here in Chicago. Turning out the food in our own kitchen is fabulous. Thanks for the help! Thanks for trying out the recipes Richard! I really appreciate the feedback. The aroma of sauteed gochujang is wonderful right? It has quite a different flavor from the gochujang in its natural state. I’m glad you and your partner enjoyed it. As much as I enjoy eating out at a good Korean restaurant, I prefer the homemade stuff. And it’s much easier on the stomach as well as the wallet! Great recipe! Instead of sauteing the green beans, I blanch it instead. Then I heat up sauce til it shimmers a bit then i throw the blanched green beans back in and mix it. DELICIOUS. Thank you so much for the recipe. 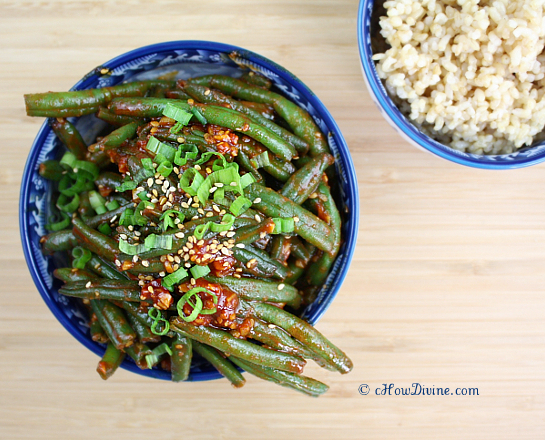 Green beans and gochujang are great together. I hope you enjoy the dish and thanks for coming by the site. Thanks for all the great recipes! 🙂 Making this tonight – can’t wait to try it. Hope you enjoy it. Thanks for visiting the site! Thanks for the recipe. I’m living in a country where I’m a little wary of eating raw vegetables, so I am trying to blanche / saute all the vegetables I eat. And string beans happen to be one of the cheaper vegetables available. I did modify the recipe for a cold vegetable and blanching the string beans then mixing in the sauce without heating it up (squeezing out as much water as possible). I’ll use for bi bim bahp, eat with rice or just sometimes by itself. Also, I have used for broccoli as well, but broccoli is 2x or 3x the price of string beans. You’re welcome Michael! Glad you found the recipe useful. I know what you mean about price of some vegetables. They can get so expensive. Thanks for coming by the site. These green beans are outstanding! I found this recipe and blog looking for a vegetable side for my spicy Korean chicken, and these (almost) stole the show! Thank you for the great recipe. I added a teaspoon of Korean chili flakes as well because we love heat. Delicious!